Pioneer Computers Australia releases DreamMicro Power Server 1U 6016T-NTRF. Home > Pioneer Computers Australia releases DreamMicro Power Server 1U 6016T-NTRF. DreamMicro Power Servers 1U 6016T-NTRF are now available from PIONEER Computers Australia on a Build to Order basis. 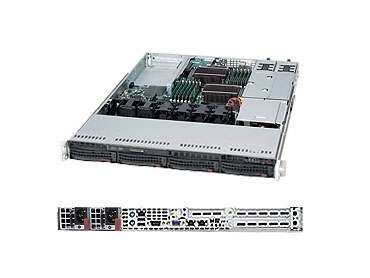 Powered by Dual Intel 5500 series Xeon Quad/ Dual-Core, with QPI up to 6.4 GT/s, the 6016T-NTRF power server can have up to 96GB DDR3 1333/ 1066/ 800MHz ECC Registered DIMM / 24GB Unbuffered DIMM. On the left of these power servers, there are 2 (x8) PCI-E 2.0 slots, while on the right (low profile), there are 2 Gigabit LAN optional (AOC-PG-i2+). The DreamMicro Power Server uses Intel 82576 Dual-Port Gigabit Ethernet Controller. In addition, it has four 3.5 inch Hot-swap SATA Drive Bays for customizable storage.